A building contractor was awarded £9.8m in government funding to rebuild one of Northern Ireland’s best known theatres after a tendering process was altered resulting in it leapfrogging from last to first as the preferred bidder, an audit office report has concluded. In 2008 the Department of Culture, Arts and Leisure (DCAL) approved the decision to appoint Gilbert Ash NI Ltd to oversee the redevelopment of the Lyric Theatre. In what was seen as a potential major conflict of interest a project board meeting called to approve the Gilbert Ash contract in October 2008 was at the same time informed that the company was also donating £150,000 to the redevelopment. However Northern Ireland Auditor General Kieran Donnelly has been unable to find any evidence that best practice procedures were used in the awarding of the multi-million pound contract as, despite requests, DCAL has failed to provide auditors with even basic tender documents used in the process. When the tender evaluation price process was launched in March 2008 Gilbert Ash came last in a list of five companies who had bid to oversee the theatre redevelopment. However, following a series of decisions to alter the tender process, Gilbert Ash went from last to first and was awarded the theatre contract. The company had initially been placed last out of five but when the panel in charge of the process chose to exclude the cost of scaffolding and other adjustments from the overall price Gilbert Ash were placed in third position. Following a weighting exercise, shifting the importance attached to price and quality, it moved to second. However then Gilbert Ash unexpectedly became the preferred bidder after the project board added an additional £113,500 to the contract of the first place bidder without informing him. Auditors state that best practice dictates that before a tender cost is adjusted it must be agreed in writing with the contractor. Despite requests auditors were not provided with any documentary evidence to show that proper procedures had been followed during the tender process. “In order to satisfy the requirements of probity and good administration, the evidence base for the decision to select Gilbert Ash NI relied upon the relevant information being evaluated,” the report states. “However we were unable to test the recommendation made in the evaluation report to appoint Gilbert Ash NI Ltd or satisfy ourselves in the evaluation panel made its assessment on the basis of value for money because a full and complete record of the process was unavailable to us. The NIAO report further reveals that the project board set up to oversee the redevelopment of the Lyric met on October 27, 2008 to approve the decision to award the multi-million pound contract to Gilbert Ash. In a highly unusual move, given it involved £9.8m in public money, no date of completion was ever set before the company was awarded the contract for the Lyric. However, it can now be revealed that at the same meeting the board was informed that Gilbert Ash had donated £150,000 to become patrons of the Lyric rebuild project. “We would not seek to discourage philanthropy in projects such as the Lyric Theatre, however, it is essential that public sector bodies identify and manage the potential for any perceived conflict of interest. Auditors raised more concerns that while scaffolding costs had initially been withdrawn from contracts they were later reinstated, with Gilbert Ash being five times more than the original most competitive bid of £84,000. “Although the scaffolding costs were excluded from the Stage 1 financial assessment of the tender evaluation, the scaffolding cost of £413,000 submitted by Gilbert Ash NI Ltd appears to have been accepted in full at Stage 2 and included in the fixed price cost of the contract. “As a result, there was no consideration given to whether the cost quoted represented value for money. In April 2005 the Department for Finance and Personnel (DFP), approved £6m grant aid for the Lyric development, which was estimated in total to cost £12.4m. However by September 2007 the cost had gone up to £15.2m – a jump of nearly £3m. DCAL covered the funding gap in full, raising its contribution to £9.2m. In October 2006 the Lyric project asked for an additional £2.73m funding. By December 2008 the cost of the project had risen by another £2.6m, with DCAL agreeing to pay another £564,000. DFP stated that it in February 2009 it had “reluctantly” given approval for a final funding increase of £714,000 to the Lyric project, despite a previous decision to cap funding. 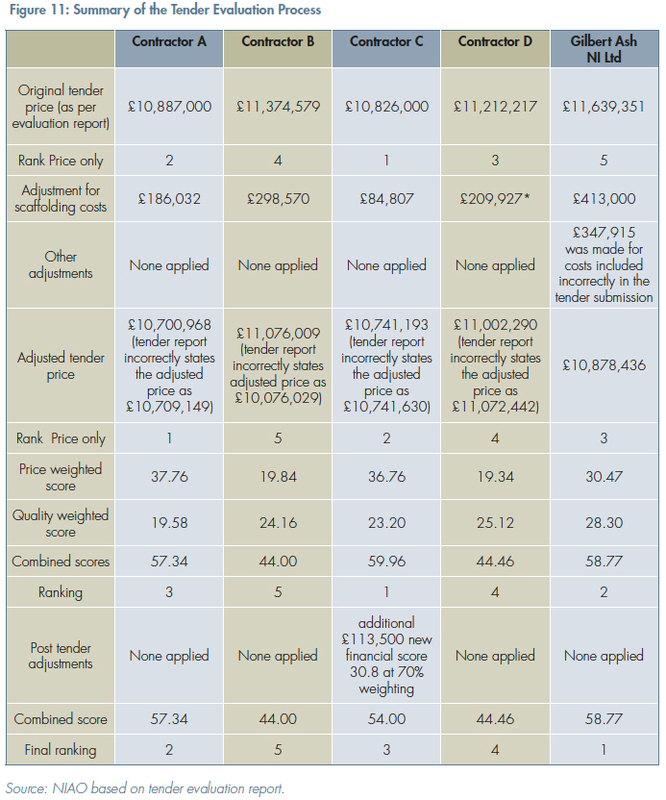 Figures show that the average cost of the project had gone from £1,605 per square metre to £2,997, an increase of 86.7%. As part of government policy the Central Procurement Directorate (CPD) is charged with overseeing best practice in public procurement. Officials from both CPD and DCAL were both supposed to ensure that the project abided by best practice rules. CPD said the adviser was not given the opportunity to review the complete tender evaluation report before Gilbert Ash were appointed preferred bidder. DCAL said there had been a six month delay in choosing Gilbert Ash as the preferred bidder and the Lyric contract being signed and it had taken CPD’s failure to express concern as a sign of approval. However CPD said that despite numerous requests it had not been provided with the information required for it to provide advice on the tender award decision. “The information that was provided was inadequate and provided after the award decision was made. CPD rejected DCAL’s claim that a ‘silence means consent’ procedure was understood in this case. “The circumstances of this case do not allow the Department to rely on this procedure in relation to CPD’s advice, i.e., there were no papers issued, no time limit for consideration and CPD was not alerted that the ‘silence means consent’ procedure was being enacted”. CPD recommends that all public procurement documentation should be retained for a minimum of 10 years. However the consultants who prepared the evaluation report advised DCAL that it had destroyed the documents after the contract was awarded. 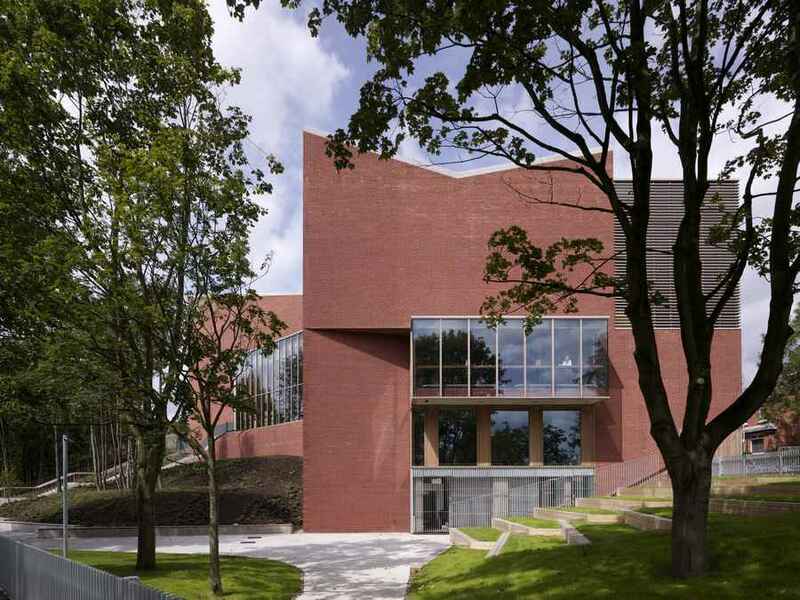 The report also looked at six other DCAL sponsored developments at the Ulster Museum, Metropolitan Arts Centre, Public Records Office, Crescent Arts Centre and Tollymore National Outdoor Centre. The NIAO report will now be discussed by the Public Accounts Committee at Stormont. A DCAL spokesman said that it had accepted all the recommendations contained in the Audit Office report. A spokeswoman for the Lyric said that it had noted DCAL’s decision to accept the NIAO recommendations. A spokeswoman for Gilbert Ash said: “We had no control over the adjustment to tender costs made during the procurement process – a practice that is standard in our industry to allow for like for like comparison of bids." “We are committed to positively impacting on the community around us. As such, we were delighted to sponsor the Lyric Theatre, a fantastic arts venue and a major contributor to cultural life in Northern Ireland.